Discussion in 'Wood and Canvas' started by slk, Nov 8, 2018. I have been experimenting with some ash I cut a couple of years ago. Soaked 2 pieces for 2 days and then boiled it for an hour today and both pieces failed. I am trying to remember about the grain. Looking at the end of the board it should be running vertical???Right??? Or should it run horizontal??? The one's I tried today ran horizontal. One other question. Is an hour long enough to boil and is there a too long time in the equation?? I have 3 more stem boards soaking. BTW they are 7/8" thick 2" wide. I got two to work with flatsawn grain, 0.8" thick, 0.9" wide. I had one failure where the grain ran out the side, right at that exact point. So I think you definitely want as straight a grain as you can get. Shaping the bevels is also easier with straight grain. My wood was kiln dried and soaked for a day. I had to make my form smaller to allow for springback. I went with whatever advice was in the Stelmok/Thurlow book and that exact amount was perfect. The steam is supposed to soften the lignin between the wood fibers. Too much steam dissolves the lignin and when it's gone, you just have fibers, which is bad. There is not a lot of advice about exactly when it's too long. I steamed mine for 1.5 hours because I'm at 5500 feet altitude so my steam is at 203 degrees maximum. That was not too long for my pieces. The general rule of thumb for steaming time is 1 hour per inch of thickness. But that is for steam that is about 212° F. -- altitude will make a difference. The wood needs to get to 200° F. and there is no real benefit for steaming it beyond that point . Of course, most of us have no practical way of measuring the temperature of the inside of a piece of wood being steamed -- which is why the rule of thumb is useful. I have read that steaming for too long can cause problems, but I don't recall hearing or reading any good standard for what is "too long." I think common sense counts here -- I don't believe there is a need to rush things, but don't break for lunch once your wood is up to temperature. The first times I tried to bend the stems for my Charles River I had to go through some trial and error. I found that my compression strap was the main culprit. If I had any movement with the relation to the wood, I would end up with a crack. I ended up lining the strap with traction tape (for stair treads) to help hold the wood in place. I also welded a set of stops to the strap that I could adjust to keep the wood from moving around too much. I have never used a compression strap. I did not have any issues years ago. I am building an Atkinson Traveler. I have done several of them, but it was some time ago. I am getting my feet wet again. I am thinking I need to inspect my wood carefully before attempting to bend. Like I had said before I am experimenting with some ash I cut 2 years ago. I am not even sure it is white ash, but looks like it. The wood I attempted yesterday had a greenish tint to it after boiling and it dried out. So it may very well be green ash. In Stelmok's book it says to boil the wood for the stem pieces. I am having to remember all of this again, as it has been a while. I used a compression strap and there was a considerable force on the end. It bent the end stop 90 degrees and the ash was all squashed and deformed, like the end of a stake after a lot of pounding. You can't really see it on the photo. Some sources suggest not bothering but it's not much extra work. That is one heck of a bend there. I got a piece of ash to bend this afternoon with no problems. I just had to check the grain on the sides for run-out, and this piece worked. 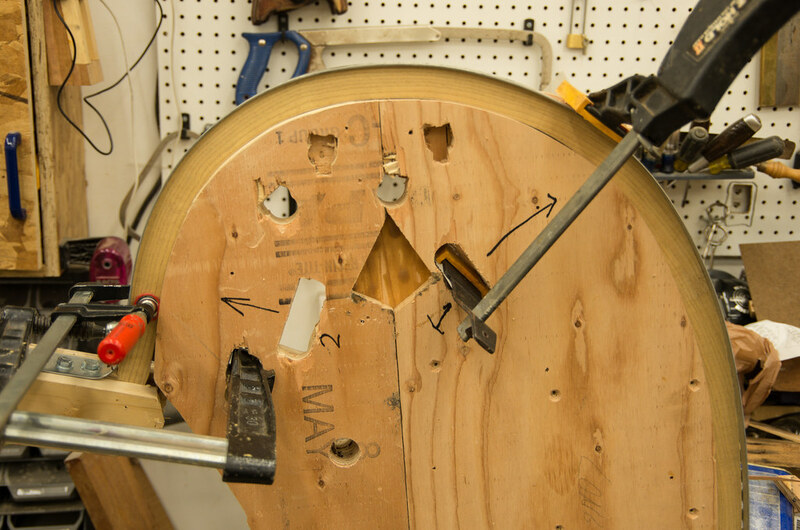 When bending 7/8" stem the difference between the radius on the outside surface can be as much as 1" greater than the radius on the inside surface. When bending the stem this means the outside top surface fibers have to stretch up to a 1/2" and the inside radius surface had to compress up to a 1/2". The nature of wood is that it can be compressed more than it can be stretched and that is why you see many more failures (breaks) in the outside surface. Using a steel compression strap with a positive stop on both ends locks the piece of wood in place (as it is straight on the floor) means it can not stretch out or expand that 1". It also means the stem will have to be compressed that whole 1". With no stretching or tension on the outside surface it is doubtful there will be any breakage on that surface. While the wood can be compressed more than it can be stretched its is doubtful it can be compressed that much. A compression failure will bend or deform the wood as seen in Dave's picture . A more serious compression failure would be a blow out like a large blister on the inside surface or it can winkle the wood or make a crease on the inside surface. The ideal situation is to have some controlled slippage of the wood and the steel strap so that the wood is under slightly more compression on the inside radius and little less tension on the outside radius. I find using one positive stop and a "c" clamp on the other end to clamp the wood and strap together works well. The clamp is very tight but the bending pressure is still so great there is still a bit of slippage between the wood and the strap. You can see the clamp on the end of the stem in the picture. The piece is extra long so the clamped part will be cut off latter. For real tight bends I have a strap that has two positive stops but one stop is adjustable so as the piece is being bent, I can adjust the stop to relief the compression pressure a bit. I can bend a 1" square stem into a 4" radius and make nice tight spirals around a round fence post that I have kicking around the shop. So far I haven't found a use for is particular piece of "art"! Rollin has it right. In general wood can be compressed by 10% without failure, while it can be stretched only 2%. The outside surface of a stem while being bent is being stretched, while he inside is being compressed. A compression strap can prevent the stretching. The tool in Rollins photo looks much like one I bought from Lee Valley Tools, http://www.leevalley.com/us/Wood/page.aspx?p=42173&cat=1,45866 I have successfully bent a 'torpedo' stem using this tool, but not a pretzel like Rollin shows. Great info. Thank you Dave, Rollin & Tom. And thanks for the link to Lee Valley. But I do wonder why they are including a ratchet wrench and socket with the strap tool - don't most people already have a wrench? I would agree with Jim that most folks who do this kind of work already have tools. The part of the compression strap that gets tightened with that wrench doesn't not have a head on it, as a bolt does, but is more like threaded rod with a 6-sided end. A 1/2" socket fits nicely. An open end wrench or Crescent wrench would do the job, though the ratchet is fast and convenient. If you buy from Lee Valley, you add the wood handle yourself, and a couple C-clamps, which you probably already own, are needed. TM..
A slightly larger radius would wrap around the tip of a beavertail paddle. Maybe a paddle storage or shipping box?